It was our weekend for the boys to stay home with us so I decided I would take them on their first trip down to Rondowa. It is a pretty easy three and a half mile walk. The boys (Kolby, Mason, & Brenden) have done quite a bit of hiking with me already. This year they made two trips into the Wenaha. One was a 2 day camping/fishing trip and the other was a day hike down the 5 mile long Elk Flats trail. They have also hiked up many steep, barely hikable ridges on the South Fork of the Walla Walla last winter. So three and a half miles on the flat is pretty easy for them at this point. I am not saying we wont ever get a straggler or whiner, but they do pretty darn good for the most part. The alarm went off at 4:30 a.m. this morning and we were out the door by 5:30. It was just a little past sunrise when we got to Palmer Junction and it was a bit chilly. Once we were moving everybody stayed warm enough. 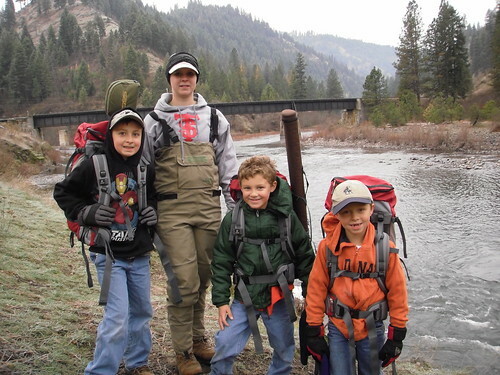 I had the boys take extra layers of clothes in their backpacks for when they stopped moving so much and started fishing. The extra clothes were well warranted. We were the first ones at Rondowa this chilly Saturday morning. After getting everybody situated with fly rods and gear it didn’t take too many casts until the boys decided they were ready for that extra layer of clothing. 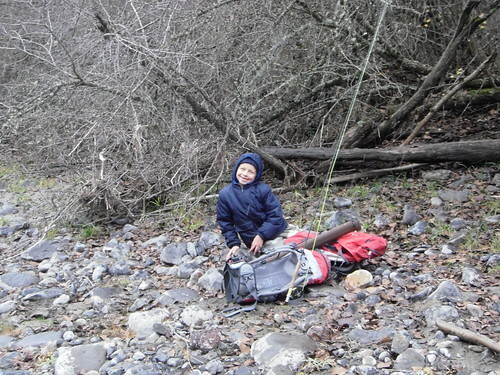 I was hoping that one of the boys would get to catch their first steelhead. I thought the chances were fair since they were the first ones fishing through the big run below the confluence today. But not even a bite for them. I fished through the run after them and was a little surprised that I didn’t get a single bite either. 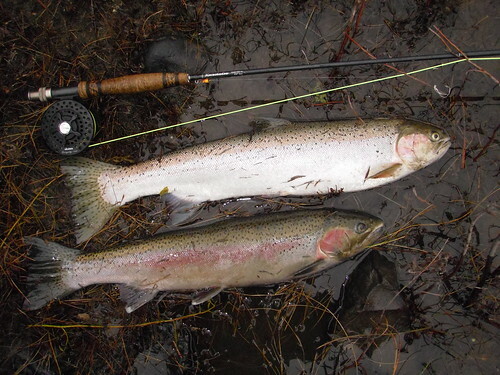 The weather is getting cold at night and the steelhead may be a little more lethargic first thing in the morning with the cold winter water. And it was wintery today. Besides snowfall off and on during the day, I was breaking ice off my guides all morning. BRRRRRR! I waded out a few times to get a little more reach out of my casts, but did not stay in the water long. I had not packed too much extra clothes, trying to balance between hiking clothes and fishing in winter clothes, and was definitely not dressed warm enough to wade waist deep in that water for more than a minute or so at a time. After fishing the first big run below Rondowa we went further downstream and fished the first big hole. Results were no better and my wife and kids were weakening quickly from the lack of fish and the cold morning. To salvage the morning I thought a walk to warm up might do everybody good. So we hit the trail and went back up the river to Rondowa and then headed up the Wallowa river for a mile or so. The walk seemed to do everybody good. We all warmed up a bit and the weather seemed like it was maybe beginning to warm up also. 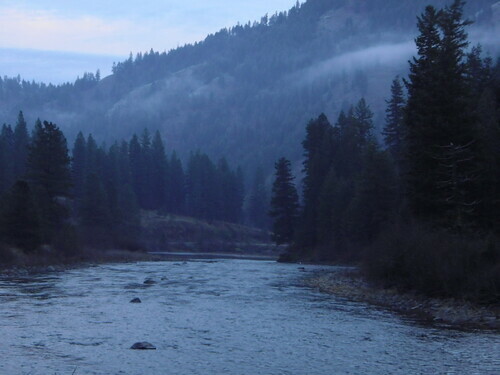 We fished the first major pool on the Wallowa with results no different from the rest of the morning. We headed upriver again to the next run and again worked at perfecting our casts since we were not getting to practice landing fish. I was beginning to feel a little demoralized by that point as well. 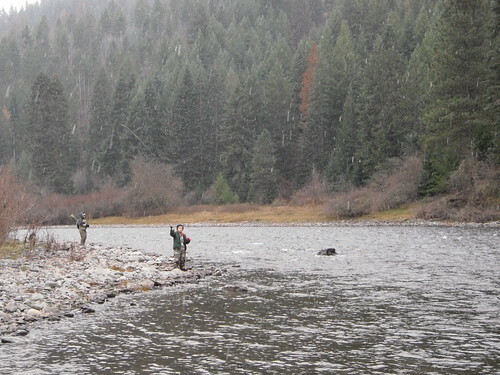 It was around 11:30 by then and the steelhead were still not joining us in our Saturday adventure. I had four faces looking at me like they wanted to head back towards the car. Knowing that freezing temperatures at night often means the best fishing in the afternoon instead of the morning, I did not want to give up completely. 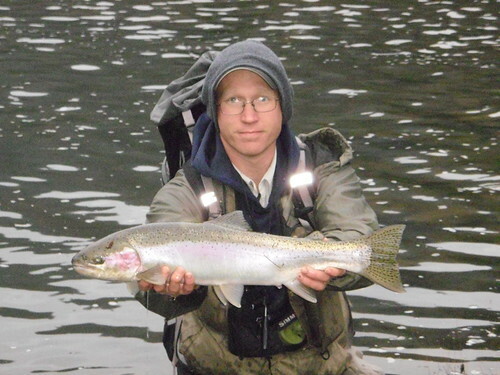 I usually don’t get skunked steelhead fishing and a lot of it has to do with simple perseverance. When water temperatures are cold, the fishing usually improves in the afternoon after the water has warmed up a little. By that point we were a good four and half to five miles away from our car anyway, so I suggested we fish our way back to the car. That sounded to good to everyone. When we got back to Rondowa there were multiple people fishing the big run, so we decided to fish some water just below the pilings of the railroad bridge for a bit. After no success there we headed upstream. I almost never hear of anyone fishing between Rondowa and Palmer Junction, but there is some nice looking water through there. I personally really enjoy it. 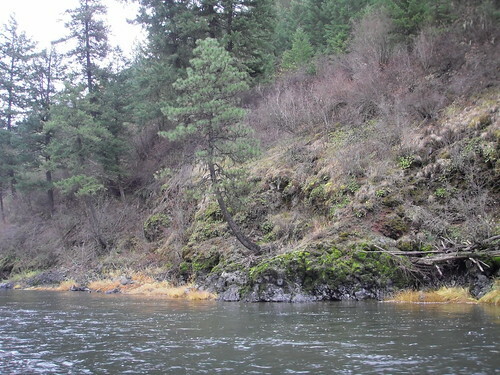 It is similar in size to the Wenaha and the Imnaha in this section. My wife and the kids were definitely getting into the “Head to the Car” mode by this time. Not too far upstream there was a decent looking spot with some depth and moderate current. The good water was on the far side of the river and a little out of reach for the kids so my wife decided to take them to the next run and let me fish this one. I fished the small run through thoroughly in fairly short order and began to walk away from the river to catch up when I noticed there was another spot that looked even better only about 100 yards upstream. I walked up to the new spot and let some line out. On the second cast my line quickly went tight from a 16” rainbow nailing my olive woolly bugger. That was nice I thought. I will take catching trout over catching nothing at all. Another cast or two and I had a second heavier fish on. This one was a bright hatchery hen. Mmmmm! Nothing hits the spot like some smoked hatchery steelhead. A few cast later and I had a second steelhead on, this one was a darker hatchery buck that took my stonefly nymph. This little spot turned into a bonanza. I caught several more nice rainbows, one more steelhead (that makes three out of this spot), one whitefish, and one bull trout. It was a decent looking spot, but it didn’t really look that good. Finally the cold water curse was off. By this time my wife had come back downstream to see what was taking me so long. Catching and landing fish; that was what was taking me so long. We fished sporadically on our way back up the river, the boys were feeling a little worn down by now with their 4:30 a.m. wake up call from me and nearly 10 miles of walking on a cold November day. I landed one more wild steelhead on the way back to the car. All in all it wasn’t a bad day. We got to hike some beautiful country, see one of the first snowfalls of the winter, and catch a few fish. If nothing else, the boys were definitely not hyperactive when we got home. Tomorrow we are heading out early again for the Imnaha.